We are the lunatic fringe (as in Victorian Sci Fi Miniature Wargamers), of a subset (as in Miniature Wargamers), of a fragment (Wargamers), of a minority (Gamers), of society. Canada does not have the industry that the Americans do, but they do have ingenuity. Having acquired a number of British made, “Protected Cruisers”, 2nd class, HMVS Naiad, HMVS Scylla, and HMVS Satona, they managed to convert a number of them into Land Monitors, in imitation of the Land Ironclads of the Americans. The conversion was hurried and many compromises were made. One necessity was the ability to deal with the extremely difficult terrain of the Canadian wilderness. The answer came in the Aberbercrumby and Smythe, Duel Reciprocating, Air Compression Engine Steam Roller. Using the powered 17 tonne roller wheel for its primary locomotion, the Land-Monitor can overcome all but the most treacherous terrain. The gun size was kept at 6” because of a large amount of cruiser ammunition in storage. And while the armor was not as thick as even the American Mk II’s, it was made up for with spaced chambers that proved resistant to the Martian heat ray. Currently there are three in service, The HMCAS (Her Majesty’s Canadian Army Ship) Daphnis, Echenais and Nomia. 3 more are currently being assembled. One interesting addition was the inclusion of a spikes to the 17 tonne roller wheel. 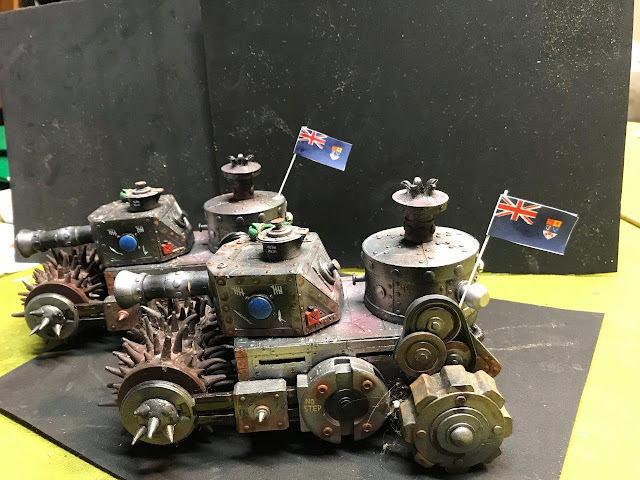 While the wheel itself was mainly to flatten vegetation and obstacles which abound in the Canadian wild, and facilitate movement of smaller vehicles, as well as acting as a layer of armor from frontal attacks. The spikes provide additional grab needed to facilitate movement in some terrain. it has proven effective in crushing drones and tripod legs. Tank 4" 3 10 to the front, 7 on the side. The first hit on the Land-Monitor causes no effect. The second hit will disable either the gun (1-5) or the engine (6-10). 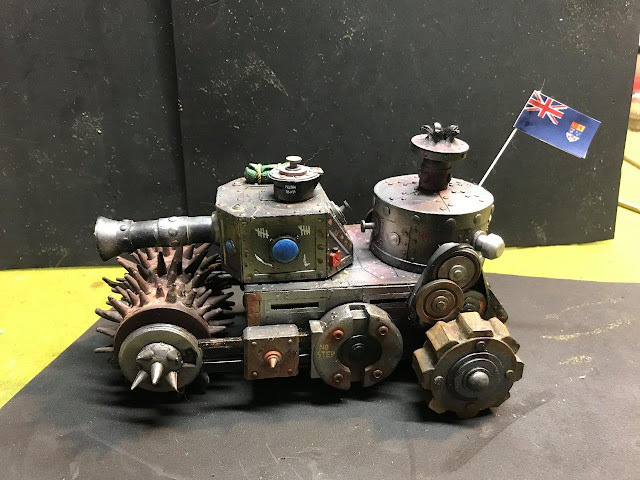 Nice usage of the Dwarven Steam Behemoth! Yep, I bought 3 at a dollar each at a flea market. Looking for something to do with them. Episode V America Strikes Back!